The makers of Kevis 8, Farmaka, Srl. in Italy are constantly researching and developing new products to combat hair loss. After several requests from customers for a product that would target problem areas on the head, 4hairloss.org and More Naturally, Inc. are proud to announce the release of the INTENSIVE SCALP SERUM! In a convenient colorless gel form to prevent running, it is applied generously to the stubborn areas on the head before bed time and left on overnight. Although it is a gel, it is not the same as a hair gel, as there is no residue or “holding formula”. In fact, the treatment absorbs and disappears within seconds after application. To review, a single Kevis 8 application vial comes in two parts. In the vial is a water based solution that contains all natural ingredients that stimulate blood flow and nourishes the hair follicle. It also contains their signature ingredient, Sodium Hyaluronate (HUCP), which helps remove unwanted, harmful molecules (such as DHT), thus allowing nutrients to replenish the main hair growing components. On the top of each Kevis 8 vial is the booster cap that you press down to release into the solution. The cap contains the world’s only protein enzyme that deactivates the DHT molecule on the scalp; thus rendering it harmless. The Intensive Scalp Serum contains the same basic ingredients as what’s in the vial prior to releasing the booster cap. But the potency has been strengthened by 2.5 times. It would take two and half vials of Kevis 8 as a single treatment to match the strength of one treatment of the serum on the scalp. This means the main ingredient of HUCP has more time and is a more aggressive concentration to target DHT on the scalp and deliver powerful stimulation and nutrients in these problem areas while you sleep. The INTENSIVE SCALP SERUM also includes SERENOA SERRULATA, a natural extract of saw-palmetto and known blocker of DHT. My experience and opinion on this product: I have used this product off and on since it was brought to market. I think it is a good product and I like the purpose of the ingredients. However, I don’t recommend using this product as your only hair loss treatment; I don’t recommend it as a standalone hair loss treatment because I question how well it inhibits the production of DHT. I plan to test this product as a stand-alone treatment for hair loss, but until I do test it I recommend using this product as a complement or in addition to another hair loss treatment, if needed. Please note: The SCALP SERUM can be used individually or as a complement or part of your current treatment regiment. 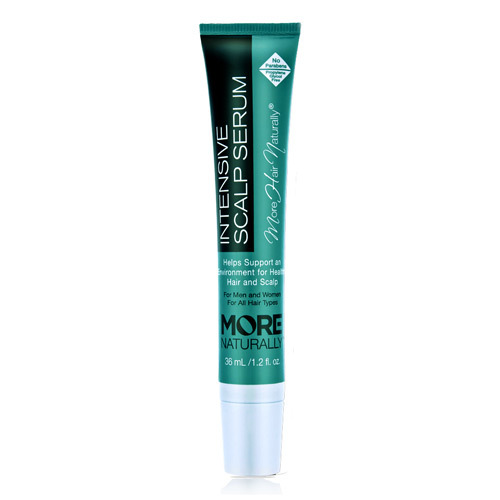 One tube of INTENSIVE SCALP SERUM will last approximately 1-3 months. Included with your purchase is 4hairloss.org’s custom instructions on how and when to use this product to get maximum effectiveness.